The best way to lie with statistics, says Andrew Gelman, is just lie. This graph from Fox news is a visual version of that. It’s published at Flowingdata.com via Media Matters. The numbers are correct, but the Foxy graphmongers are making up the Y-axis as they go along. The 8.6% of November is higher than than 8.8%, 8.9%, and maybe even the 9.0% of the first three months of the year. Or maybe it’s an optical illusion. Also, the slope between 9.0% and 8.9% is greater than the slope between 8.9% and 8.8%. So, too, the slope between 9.1% and 9.2% is also greater than the slope between 9.0% and 9.1%. 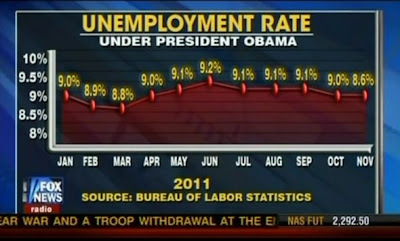 Over at FlowingData, you can see that the graph looks like when the line is drawn properly (http://flowingdata.com/2011/12/12/fox-news-still-makes-awesome-charts/ ). That page also has a link to the BLS page on unemployment, and you can download the data there (going all the way back to 1948). haha, the 8.6 is equal the the 9.0 right next to it...how dumb do you have to be? Using a ruler, it is higher than the 9%. Fox stole good news from the American people, news that needs to be heard, especially this time of year. They know people are only going to look at the end of the graph. Like the rest of you, I think Fox News (and pretty much all other news) radically frames and reshapes the information it gives us. However, the only major error on this graph is the last dot (albeit, the slopes between the first three points are slightly skewed, but this could be because the numbers are not exactly 9.0, 8.9, 8.8 and plotted to a greater accuracy than displayed). The final dot is likely just a simple error. Statistics are widely abused and manipulated in complex and astounding ways - this is just not a very good example of that. Pretty terrible. I'd blame a lazy graphic artist more than malicious misstatement of data, I've seen a lot of people who edit text on charts or graphs with new numbers after the chart is already built because they don't have time to go back or access to the original program to update the chart properly. Yup. The last point of the plot is clearly wrong. Is this somehow a mistake or is it a purposeful manipulation? There are think tank interns who don't get paid to turn out charts just like this. Not to mention there is no zero point. Not only is this graph weirdly inaccurate (and doesn't really seem to prove much of a point) it's hideously ugly. Fox understands their viewership, the "low-information" voter. They do this all the time -- subtle manipulations that, if they get called on it, they can claim as a simple mistake. Except that they are not mistakes, they are calculated to provide disinformation. I'm not big on conspiracy theories, but Fox clearly manipulates information and provides an inaccurate view to a segment of people that are easily manipulated and who use Fox as their only news source. Orwell lives. Thank you, Mr. Livingston. I have reblogged this at http://pedanticpoliticalponderings.blogspot.com/2011/12/repudiation-fox-news-fake-graph.html I've also included a correct graph from Flowing Data. I'm sorry, but in what world is 23% less than 22%? of jessicasingle.here u can know more about me . Does anybody know what the accompanying commentary was to this? I'd be curious to know whether they voiced it over in a positive or negative way.